Natural kitty litter is widely used by pet owners all over the world, but clumping kitty litter is fast gaining fans of its own. 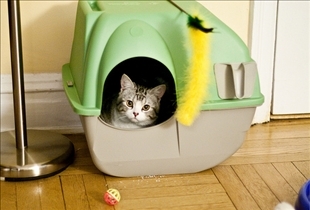 Both essentially help cat owners deal with the mess that their pets leave behind, although they do have their own advantages and disadvantages. In this comparison article, we take a look at the relative strengths and weaknesses of both. Clumping kitty litter was originally introduced in the UK in the 1950s. A product of the Fuller's Earth Union (later a subsidiary of Laporte Industries Ltd.) clumping kitty litter was made with calcium bentonite. This variation of bentonite was less sticky than American bentonite and tended to swell less as well. In the United States, a biochemist by the name of Thomas Nelson developed clumping bentonite in 1984. Most products marketed as clumping kitty litter are made of granulated bentonite clay, which forms clumps when they become wet. They thereby form solid masses that are easier to separate from litter remaining in the box. This allows pet owners to simply dispose of the clumping kitty litter without having to throw out all the litter in the box. 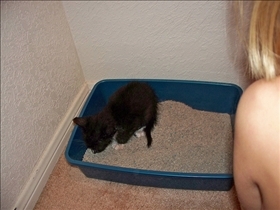 Kitty Litter is actually the name of the first natural kitty litter sold on the market. Developed by Ed Lowe, the product was available as early as 1948. Before the introduction of natural kitty litter, most pet owners simply filled litter boxes with sand. Natural kitty litter gave pet owners an option that was a lot more absorbent than sand, and that was also less likely to be deposited outside the litter box due to its larger grains. Natural kitty litter today is quite inexpensive, and is widely available in many retail stores. Clumping kitty litter is made of Bentonite, which itself is an absorbent form of aluminium phyllosilicate. This compositionally impure clay is made mostly of montmorillonite. Bentonite itself has the quality of forming clumps of volcanic ash when combined with water. Natural kitty litter looks very similar to the clay-based oil absorbents that are typically used for cleaning up oil spills. In fact, this latter product is often used as a substitute for natural kitty litter as it is a lot cheaper, and works almost just as well.Most brands of natural kitty litter are made of zeolite, diatomite or sepiolite. Many brands of clumping kitty litter contain crystalline silica or silica dust in addition to its main active ingredients. This particular ingredient has been identified as a carcinogen in California. While the silica in clumping kitty litter isn't considered a significant health risk to humans, there are as yet no studies that show its effect on cats. As for natural kitty litter, it may give off a bad odor at times. This is why it is a good idea to store such products in areas of the home that aren't often used. Which kitty litter usually smells better?